Sarah Pape teaches courses on Editing & Publishing, as well as Advanced Composition for Future Teachers at California State University, Chico. 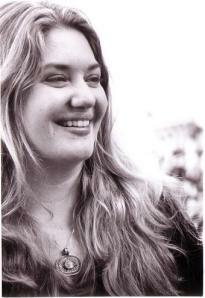 She works as the Managing Editor of Watershed Review, CSU, Chico's literary publication. Her poetry and prose have recently been published or are forthcoming in Ecotone, Crab Orchard Review, The Pinch, Smartish Pace, The Collapsar, Full Grown People, Pilgrimage, The Rumpus, Mutha Magazine, California Northern, The Superstition Review, The Southeast Review, Hayden’s Ferry Review, and Cadence of Hooves: A Celebration of Horses. She is the recent winner of the Harpur Palate Award for Creative Nonfiction and is a member of the Squaw Valley Community of Writers. Pape serves on the Literary Committee of the 1078 Gallery, a volunteer-run, non-profit organization offering art, music, theater and literary events for the Chico community. In addition to curating a reading series and workshops, she has organized collaborative art shows, featuring writers and artists of all mediums. She is currently working on a full-length poetry manuscript, as well as multiple creative nonfiction projects.